Key West Private Yacht Charter & Boat Charters. The perfect Sunset Sail! Key West Private Yacht Charter & Boat Charters. The perfect Sunset Sail! 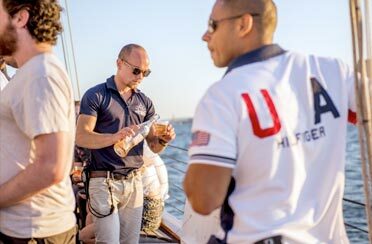 Are you looking to do a Key West private yacht charter aboard a luxury boat for your next company party? Or are you looking for the perfect party boat in Key West? What about planning a destination Wedding? 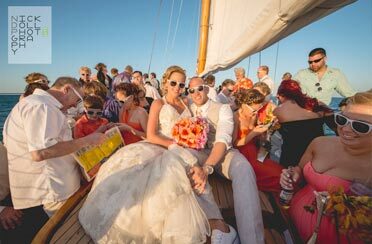 Our boat is a unique event space in Key West for a private boat charter. This certainly is the perfect way to dazzle your clients, employees, friends or family. Charter our yacht and cruise (or sail) through Key West with us. Sail alongside the Dolphins or catch a glimpse of the famous Key West “Green Flash” at sunset. Not only is this a unique event space but is the best way to host a party. 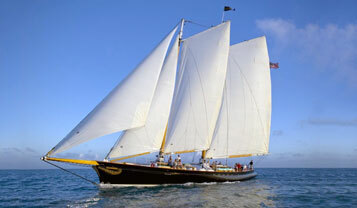 For your Key West private yacht charter we have the beautiful 105 foot Schooner America 2.0. The Schooner America 2.0 was built for performance. For this very reason you will experience the exhilarating feeling of sailing aboard this stunning 105 foot sailboat. We are located in the historic Old Town Key West. Our cruises will depart from the Key West Bight which is directly behind the Schooner Wharf Bar. We will take you out into the emerald green waters of Key West for an event you are sure to never forget. To sum it up, our yacht is perfect for a variety of ideas and will fit your every need. It is is perfect for just you and your loved one to celebrate your milestone anniversary, for celebrating a beautiful marriage or even a family reunion. Let our professional crew treat you like royalty and cater to your every need. So step aboard and join us for a Key West Sail! 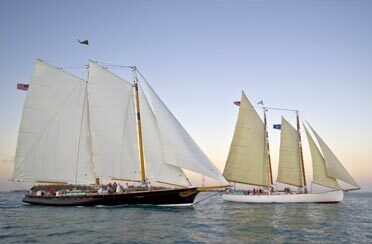 Classic Harbor Line: Known as the boutique of Key West yachts, boasts the elegant and legendary Schooner America 2.0. This yacht is known for its quality craftsmanship, and its intimate, elegant and comfortable environment. From the Schooners’ beautiful sails and construction, to the experience of sailing through the emerald green waters of Key West this is a yacht for taste and style. Classic Harbor Line has constructed and hosted a variety of Corporate and Small office functions for the entertainment and excitement for you and all your colleagues. These yachts are a unique way to host your Key West corporate yacht charter! Your employees, clients and friends will never forget the experience. 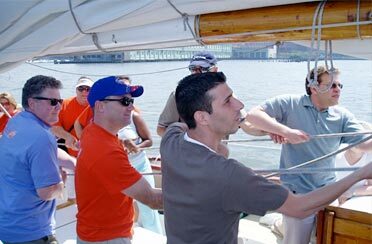 Perfect for any corporate team-building event, the Schooner America 2.0 has a fun, competitive, and educational team-building program. With hands-on activities, teams will not only have a great time but will also collectively learn about the basics of sailing and line-handling. Made another trip around the sun? Then it is time to celebrate under the sun aboard on of our classic sailboat, America 2.0. Grab your friends and family to celebrate the big 3-O, 4-O, 5-O, or even the 1 double-O! All ages are welcome aboard for a celebration to last the ages. ‘Tis the Season for Holiday Parties! 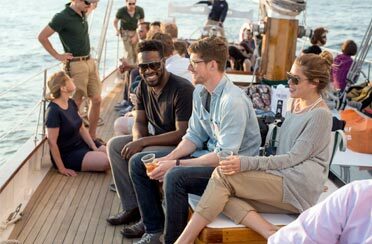 Join us on the Luxury Schooner America 2.0 for your office holiday party, family gathering, or night out with friends; our classic yacht is sure to dazzle even your pickiest of guests. The Schooner America 2.0 is best during the Holiday Season to accommodate 20 – 76 guests. 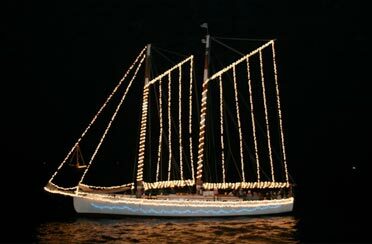 So throw a classic Key West Holiday boat party for your favorite people. Think outside of the box for your next meeting or conference. This unique meeting space with the famous Key West Sunset as your backdrop will be sure to impress. The dazzling Schooner America 2.0 can facilitate meetings, seminars, sales conferences, networking events and client meetings for 20-76. 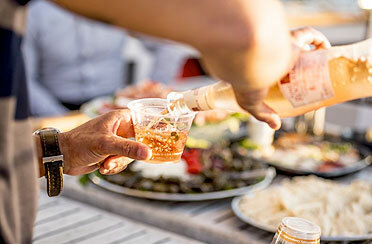 Whether you are interested in wine and cheese or making the perfect cocktail you will be sure to love these fun events aboard our classic yacht. Jump into the wonderful world of wine aboard the Schooner America 2.0 and enjoy a Key West Sunset while educating yourself in a fun manner!